Mozilla released Firefox 6 just 2 days ago and pushed its Firefox 7 from Aurora build to the Beta phase on the same day. Firefox 7 Beta is now available from download from Mozilla’s update channel. Key improvements in Firefox 7 is its minimal memory usage. As we all know, Firefox 6 hogs down your memory considerably. I myself have tested it out by opening multiple tabs on Firefox and checking the memory consumption rate. When it takes 1,00,000K amount of memory for just 2 tabs, you can predict at what pace the memory rate will jump when 3 or more tabs are open. This is why Mozilla team is introducing the MemShrink project with the release of Firefox 7. A project solely concentrated to clean out the memory leaks and crashes seen in the Firefox browsers. Mozilla team is claiming that it is getting successful results. Azure Direct2D for Canvas which renders canvas based animations in HTML5 smoothly. Firefox Sync is faster now which means all your passwords and bookmarks will be synchronized instantly. New add-on to be introduced called as Telemetry which allows users to send performance data to Firefox developers. Firefox 7 is destined to be released this September 27. But for other anxious people who can’t wait, here is the Beta download link. I think Firefox 7 will be a good news for everybody and since Mozilla has introduced this rapid updates we will be seeing a new version of Firefox released every 6 weeks. I am very excited for its release. Are you? Place your thoughts by a comment and we will get back to you right away! The Tor Project and Electronic Frontier Foundation(FCC) brings a Firefox Extension Called “HTTPS Everywhere” which encrypts your communication with Major Websites..
At Present, Though Many of The Sites support Encryption over https the effect is Limited as almost all of the Websites have made Unencrypted http as default. This Firefox Extension “HTTPS Everywhere” makes Everything https for the supported Websites.. That means it rewrites the requests and makes sure that https is default. The Mozilla Developer Preview 3.7 Alpha 5 (code name for firefox 4.0) is available for download here. Many sites on the web offer some limited support for encryption over HTTPS, but make it difficult to use. For instance, they may default to unencrypted HTTP, or fill encrypted pages with links that go back to the unencrypted site.Like the way google does. Software developing has advanced dramatically. Today, almost anyone, ranging from a high tech IT expert all the way down to a high school kid, are software developers. They need not be the creator of a software who has done a lot of coding, but instead, some software developers are just people who modify open source software and release them. You too can make your own software ! !This software which you make can be portable and simple. For this tutorial I’ll prefer using FastStone Screen Capture. You can download the 30 day free trial to try it out yourself. Just go to the FastStone site and visit the download page. You get the option of downloading either the setup or the portable version directly. This gives you the flexibility of making your software. To begin with, just download the portable version. Since I’m first trying it with the Portable .zip version I downloaded, you can do the same. After extracting the file you download, you’ll find a lot of files. But the file which you need to run is FSCapture.exe and the remaining files are required, but they just make it look more ugly. So lets try to make 1 file which runs this portable app. For this, just select all the files in the folder, and right click, if you have Winrar installed then you should get the option Add to archive. Select that option. In the new pop up you find, select Create SFX ARCHIVE. This should make your compressed archive as .exe format. In the MODES tab, just select UNPACK TO TEMPORARY FOLDER and in Silent Mode select HIDE ALL. You can also make your own license to this. For that just see the license tab. You can fill in the details and the user will be prompted to accept the license if he/she wishes to continue. Under the text and icon tab you can choose your icon if you want any. Else the default winrar icon will be used. Now you should notice a new file called FSCapture-Portable.exe in the folder you was working on. That is the only file you need. Copy(or cut) paste that file into the desktop and run the file. In a few moments it should run your software. But what if you don’t find a portable version download ???? I just consider that the portable files are in that folder. I do the same procedure, just select all files in the folder and compress it into a .exe file with Winrar giving the same commands. Want to try this with other software ?? Sure, almost any and every software will work. That should make Firefox into 1 portable file !! You can repeat this for any software, though not all software will work this way. But I’ve managed to do it to several software. I now have my own Portable Photoshop CS4, Dreamweaver CS4, Counter Strike, NFS Carbon, etc. All these as portable files. Why should I do this anyway ?? Whats the purpose of all this when I can just install the software ? If you want portable software in your pen drive ready-made for you, then you can check out PortableApps.com. They have many awesome portable software which will run only if you install their software first. Mozilla Firefox has been considered the fastest browser by internet users across the world. Yet, did you know that you could actually speed up firefox even more ? Firefox has set some speed limits so that slow connections will get a good browsing experience, but for users with a fast internet connection, the true potential of Firefox is locked down by default. Here is a simple trick to unlock your maximum potential of firefox. HTTP pipelining is a technique in which multiple HTTP requests are written out to a single socket without waiting for the corresponding responses. The pipelining of requests results in a dramatic improvement in page loading times, especially over high latency connections such as satellite Internet connections. Allowing HTTP pipelining will allow fast internet connections to reach their maximum potential. For this, a minimum internet speed of 256 kb/sec is recommended. 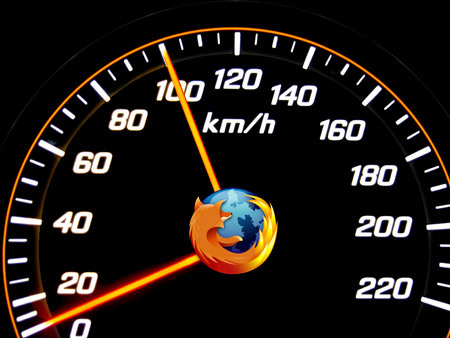 The faster your internet speed, the better will be the performance improvement of Firefox. Set network.http.pipelining.maxrequests to about “30“. This means your browser can make 30 requests at once. Don’t set it above 30 otherwise some sites may consider you as a spammer. Change this value to “0” to wait zero milliseconds to wait for splash screen. Mozilla suggests the value to be 250 for average speed computers. That’s all. Restart Firefox to observe the changes. For a internet speed of 256 kb/sec your Firefox speed will become about 150% and for fast internet connections it can go upto 700%. Basically Firefox has it disabled by mistake so that users with slow internet connections will also get a good browsing experience. But for high speed internet users, this function can be enabled manually. This makes Firefox even more customizable. Make sure you make note of what you change. You can always undo these changes later. Try it out and tell us your results…..